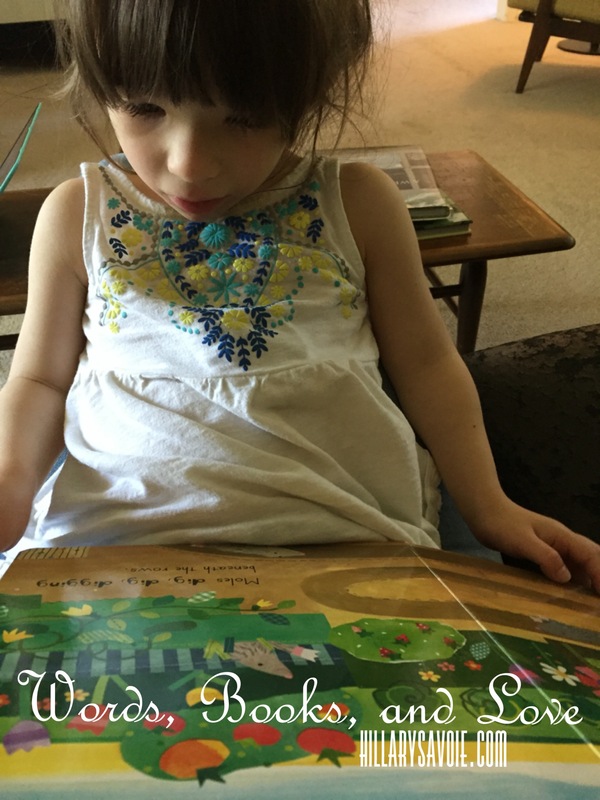 Lately it is becoming clear for that my daughter and I share a passion for reading, for words. I am always been a highly verbal person. I experience my world linguistically in many ways. I encounter the world through words. But I have a five-year-old daughter whose special needs and medical fragility leave her virtually silent. Reading with her has been limited in many ways…but I am learning, slowly, how to sync up our love for words and books. She’s fixating again. It’s time to switch gears. “Esmé,” I say, “Maman wants to talk to you. Here, give my the bus. I’m turning it off, we can play with it again later.” I say flipping the tiny switch on the underside of the bus and setting it on the ground away from her. A moment later we plop down on the couch together, we are side-by-side, but her feet rest on my lap. My left arm wraps around her back. “Esmé,” I begin, producing two laminated cards with my right hand “do you want to take a bath?” I hold the cards in front of her. The first card says “YES” in green letters. The second card says “NO” in red letters. She looks back and forth a couple times and then selects. No. I glance at the stack of Esmé-approved board books next to me on the couch. She has hundreds of books but we read the same five or so on loop. “What about I Love You Stinky Face?” I ask, holding up the book, she reaches for it, excited. As we settle in to read the book through what I can only guess will be ten or so times, she, the designated page turner, opens up the book, and waits for me to read the first line. I grab the large book at flip to the first page. The drawings are stunning. I begin reading. By the end of the first page her body is twisting, each time I begin to read. By the fourth page she is writhing, her hands slamming the book, pushing it away, as she tries to slip off of my lap. I put the book down and lift her back up to my lap, “Ok, Where is the Green Sheep, then?” She leans back against me calmly, by way of consent. When I was eight, my mother and I lived alone in a tiny apartment. It was cold. I thought it was an adventure. On the coldest nights we would climb in bed together and read, snuggled up, warming ourselves under piles of blankets that held our body heat underneath. One evening we started A Wrinkle in Time. We read through most of it in one evening, pausing only to make giant cups hot chocolate on the stovetop from milk, cocoa powder, sugar, and just a pinch of salt (to bring out the chocolate flavor, mom explained). In the kitchen, in our sweaters and hats, shivering, we giggled. Back upstairs in her four-poster bed—the bed that would be mine in high school, the bed that had been my great-grandmothers—we read and sipped from our mugs. My cat, Cosmo, curled up next to us. The time crept passed my bedtime, and still we read. We read until I was falling asleep over on her shoulder, and her eyes were heavy. Esmé is crying. I’m balancing her body as she thrashes, her hand slapping at my face, grabbing my lip. Actual tears are spilling out of her eyes. I am squatting next to her, trying to get her to focus. My legs are going numb. “Ezzy, Maman is going to tell you your favorite book, Who’s in the Garden.” I say, and begin the opening words of the book that I’ve memorized from years of repetition. Immediately, she stops crying. Her eyes open up wider. She leans her face in so our noses touch. She watches my lips move, and the stares off distantly, eyes moving slowing back and forth, as if she is remembering the page for each line. Even the tear on her cheek holds still, waiting. When Esmé was in the hospital after her cardiac arrest, uncertain whether she was going to survive I worried I’d never have the chance to read her A Wrinkle in Time on a cold night, snuggled in bed together. She was only three months old, and unconscious, intubated. Still, I bought the book on my phone and began reading it aloud to her. At some point, reminded by the glimpses at a budding young romance between Meg and Calvin, I became obsessed with the question of whether Esmé would ever fall in love. I remembered those moments safely snuggled in bed with my mother, wondering what goofy, kind, smart boy would be the first boy I kissed—imagining the adventures my life would bring me on. I found myself sobbing at Esmé bedside. When she was a girl my mother used to read Edgar Allen Poe late at night in her room. It was not permitted, so she did so with a towel thrown over the lamp, so her parents wouldn’t see the light under her door well passed her bedtime. Once the towel caught on fire and she threw it out of her window and into the snow bank. Her mother, confused, found the burned and disintegrated towel the following spring. I was always allowed to read as late as I could manage. I’d fall asleep, in my great-grandmother’s four-poster bed, Cosmo purring, his long body stretched out along my side, open book on my chest. And so we started ready Harry Potter. We have read a chapter a night for six nights. She sometimes wiggles to get comfortable in the beginning. But once we start, she lays back, eyes distant, imagining what I am reading to her, I think. She smiles at the funny parts, much of the time. And she drifts off before the chapter is through. But if I stop reading, her eyes flicker open as if to say, No, Maman, keep reading. How wonderful to be able to share your love of the written word with your daughter, just as your mother did with you. It’s not the same experience, but it’s the same love and connection as Esme snuggles in your lap and listens to read. Thank you for joining Who I Am this month, Hlillary! You tell the little pieces of your story in a way that touches me each time I read. Thank you so much Dana! I am so glad the piece spoke to you! And I am thrilled to have linked up through Who I Am…thank you for the opportunity to do so! I am so pleased to be able share my world with Esmé with others. And it means so much to me to know that others enjoy hearing about my girl! Thanks Kristi! I look forward to Finish the Sentence every week! I’ll be curious to hear how Tucker enjoys Harry Potter when you are both ready for it! I read to my son with Autism (he’s 15) and it calm him as well. I haven’t tried books without pictures – perhaps I should. Lord know I’m tried of the same old books. I bet you’ve been reading some of those books for 15 years!! I found that as long as Ez is a bit on the sleepy side of things, she will happily listen to non-picture books! Visiting from Finish the Sentence. I’m a sporadic linky-upper so I think this is my first visit to your beautiful world of stories. This was lovely and I want you to know I feel that you are creating magical memories for your daughter just the way you look back with fondness at the magical memory of reading A Wrinkle in Time with your mom. Thank you so much for coming to check out my stories! I think you are absolutely right…this is the beginning of something really magical. I feel so connected with Ez reading to her at night. And it certainly makes me feel very connected with my own mother as well! What a beautiful tribute to a mother’s love and shared love of reading. I smiled as I read your description of the chapter book you are now sharing with Esme, knowing, of course, it was Harry Potter. J. K. Rowling certainly has had a profound effect in the world of literature, capturing the hearts and minds of generations of book lovers. Thank you Mocadeaux! We are so enjoying Harry Potter! I hadn’t read the books yet, so it is especially fun for me to learn all about this new world!